Owning property on the shores of the Spokane River is a rare and valuable thing. Add a dock, says Cliff Mort, president of Neighborhood, Inc., and that value doubles or triples. That’s what Mort was thinking when, in 2005, he bought 60 acres — including 30 parcels along the river — in Spokane Valley above Upriver Dam. That’s what he was thinking when he pumped $4 million into sewer infrastructure, turning dumpsites and gravel pits into habitable, developable land. He called it Coyote Rock Acres. The price for a building-less waterfront parcel begins at $299,500. But those docks have become a prime target for ecological activists. With one dock built already, Trout Unlimited and Rick Eichstaedt, Center for Justice’s Riverkeeper, have challenged the permits Fish and Wildlife have issued. At first, that seems counterintuitive. Fish like docks, right? They congregate under them. That’s the problem. For bass, at least, the darkness beneath a dock makes a perfect hiding place. Redband trout like the shade as well, Eichstaedt says. When small redband trout meet largemouth bass, the bass leave with a full stomach. 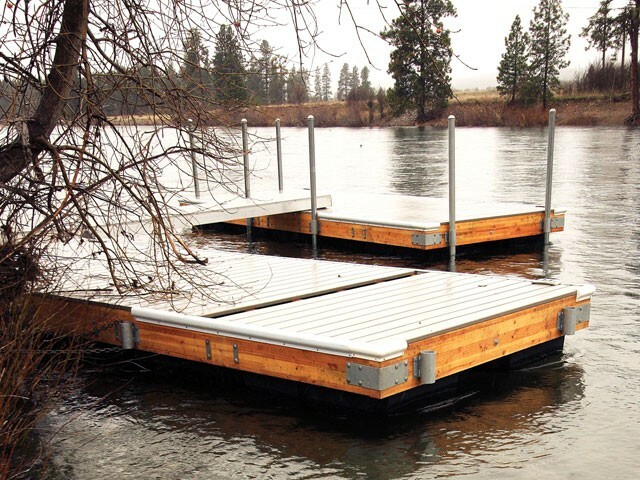 Add 30 new docks, Eichstaedt worries, and watch the non-native bass population skyrocket while the redband trout population sinks even further. But Fish and Wildlife approved the permit anyway. After all, in the paperwork submitted, there was only one dock-building request. Eichstaedt is asking Fish and Wildlife to consider the cumulative impact. “How many docks does it take until they realize it’s going to have an impact?” Eichstaedt says. Jeff Lawlor, with Fish and Wildlife, explains that his job is to look merely at current requested permits. If they have to consider any possible future developments, Lawlor says, it gets rapidly more complicated. Neighborhood, Inc. hasn’t sold all 30 properties yet, Mort says. With the dour real estate market, that may take a long time. Since each future builder may have a different vision, it makes more sense to him to help each builder apply individually. Mort doesn’t believe his docks will harm the fish. Locals have other concerns. Fly-fisher Mark Pinch hears grumblings of neighbors who worry that the docks may damage the river’s aesthetic. For Mort, at least, getting those docks approved is crucial. “We wouldn’t have put in all the infrastructure had we have not thought that docks are an allowable use,” Mort says.